The year is 2066. A Caltech intern inadvertently notices an anomaly from a space telescope – something is approaching Saturn and decelerating. Space objects don’t decelerate. Spaceships do. A flurry of top-level government meetings produces the inescapable conclusion: Whatever built that ship is at least 100 years ahead in hard and soft technology, and whoever can get their hands on it exclusively and bring it back will have an advantage so large, no other nation can compete. A conclusion the Chinese definitely agree with when they find out. The race is on . . . Many of you probably know John Sanford as the author of the Prey series or Virgil Flowers books, but his newest novel is a departure from his usual thrillers. Saturn Run is a science fiction story set in the near future in 2066 and is every bit as compelling and entertaining as his crime thrillers. This is realistic science fiction with well-developed, likable characters. It’s the type of story that could, just maybe, happen by 2066. 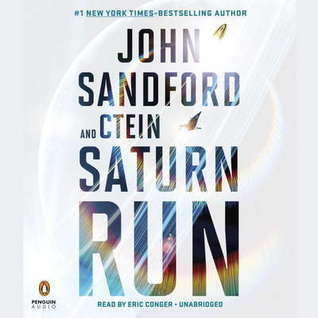 Although there is some technical detail, the novel is well-researched and is more about the characters, politics, and the race to Saturn than ‘outer space’. Science fiction fans will enjoy Sanford’s departure into a different genre. Non-scifi fans, don’t worry about understanding the technical jargon, the story is just as good even if you don’t know, or care, how a nuclear reactor works. I loved it – I hope he brings back the characters for a sequel. I do love Virgil and Lucas but I’m not sure about sci-fi. I’ve been trying to decide if this might work for me or my husband. He reads both the other series by Sanford. I do like sci-fi very occasionally. Nice to know that it has a good story, even with all the techie details. I had this book in my hands at the library and really wanted to bring it home, but my next 4 print books are lined up already so I put it back. I’ll have to see if they have the audio since you liked it so much!